Animation of the intensity of ocean surface currents as predicted by MyOcean’s global ocean model (1/12°) after assimilation of altimetry data. In addition to major currents such as the Gulf Stream, the turbulence driving the ocean circulation is visible. The blue-to-white colour scale represents surface currents in metres per second. Ocean measurements from ESA’s CryoSat mission are being exploited by the French space agency CNES to provide global ocean observation products in near-real time. Understanding sea-surface currents is important for marine industries and protecting ocean environments. As it orbits from pole to pole, CryoSat’s main objective is to measure the thickness of polar sea ice and monitor changes in the ice sheets that blanket Greenland and Antarctica. But the satellite also features an innovative radar altimeter that not only detects tiny variations in the height of the ice, but can also measure sea level and the height of the waves. Starting today , CryoSat ocean measurements are being processed by CNES and distributed to the oceanography community. These products will be assimilated using models from the MyOcean project in near-real time to enhance sea surface products and to improve the quality of the model forecasts. “This achievement is the result of the long-standing collaboration and partnership between ESA and CNES,” says Tommaso Parrinello, CryoSat Mission Manager. “Through a fusion of processors derived from operational altimeters and experimental software developed specifically for CryoSat’s innovative instrument, CNES experts will be able to transform raw ocean data flows from CryoSat into a quasi-operational end-user ocean product of high quality. With MyOcean’s 3D model forecasts, it is possible to predict the trajectory of particles (red dots) initially positioned near the Fukushima power plant (green square). 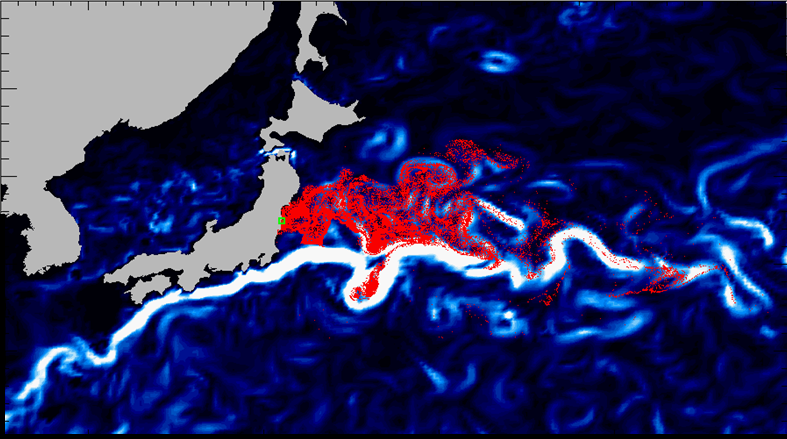 Understanding how the radioactive pollution is driven by local ocean turbulence and the Kuroshio Current (background image) is important for identifying critical areas for the fishery industry. Coastal models and applications will also benefit from the additional coverage provided by CryoSat. Users can obtain these products through the AVISO website or MyOcean data portal. Within the Global Monitoring for Environment and Security (GMES) programme, the MyOcean project is responsible for the development of marine monitoring services. During major crises such as the Deepwater Horizon and Fukushima disasters, MyOcean models exploited remote sensing data – in particular, altimetry data – to help monitor these crises. Altimetry data is of highest importance to predict the evolution of local marine currents in near-real time. Like sea-surface temperature features in the Gulf of Mexico (background image), the Deepwater Horizon oil spill, here detected by SAR sensors from the Radarsat-2 satellite (black stain), is pumped away by the Loop Current observed with altimetry (black arrows). A wide range of operational marine applications and services with social and economic benefits needs sea-surface currents: oil spill or marine debris tracking and prediction, fishery and offshore industry support, including cost and risk reduction, optimised ship routing, iceberg detection and alert for worldwide ship racing. 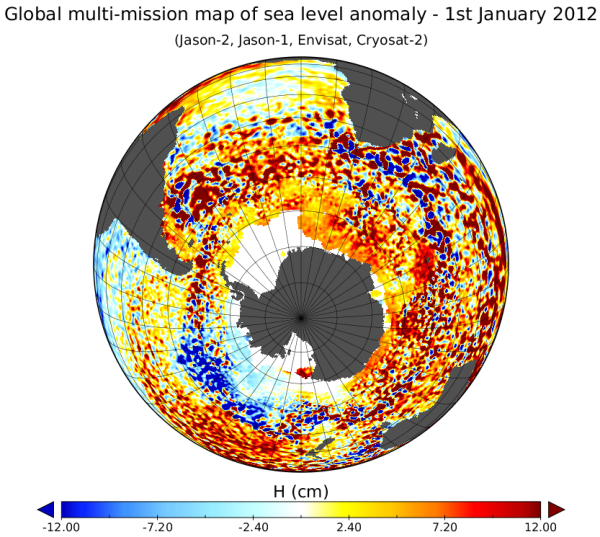 Sea-surface topography Altimeter data from ESA’s Envisat and CryoSat-2 were merged with CNES/NASA/NOAA/Eumetsat satellites Jason-2 and Jason-1 to produce this map of sea-surface topography on 1 January 2012. Since the launch of the first European Remote Sensing satellite in 1991, radar altimetry has been used to observe ocean surface topography and geostrophic currents continuously. 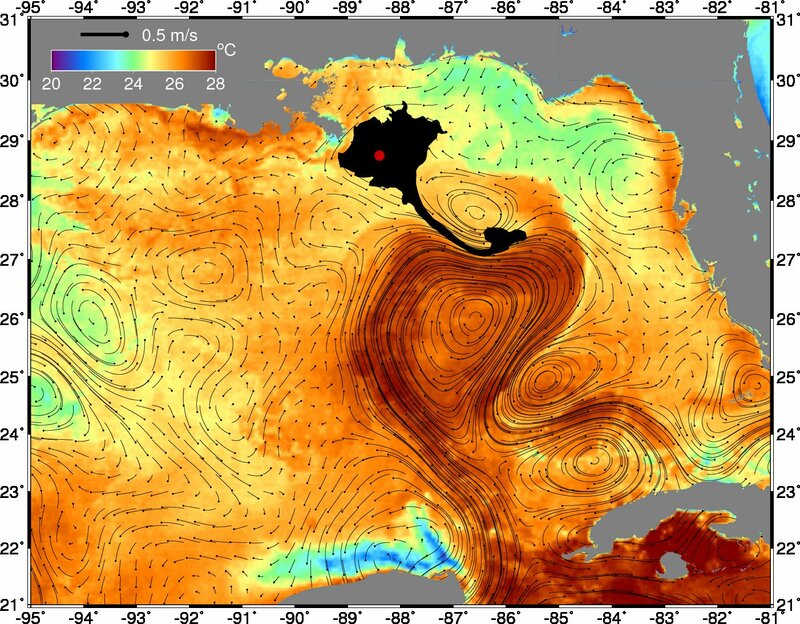 It has become an invaluable asset for the accurate forecast modelling of ocean currents. Race to the bottom of the ocean: Why go down?